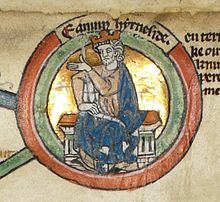 On 30 November 1016, Edmund died. The location of his death is uncertain though it is generally accepted that it occurred in London, rather than in Oxford where Henry of Huntingdon claimed it to be in his sordid version of events, which included Edmund's murder by suffering multiple stab wounds whilst on a privy tending to a call of nature. Geoffrey Gaimar states a similar occurrence with the weapon being a crossbow, but with a number of other medieval chroniclers including the Encomium Emmae Reginae not mentioning murder, it is thought Edmund's cause of death may possibly have been caused by wounds received in battle or by some disease, but it is certainly a possibility that he was murdered.